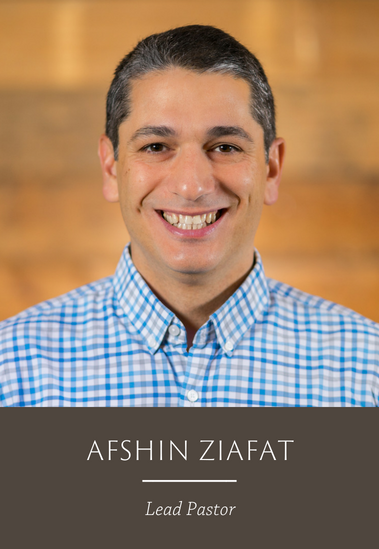 Afshin Ziafat is the lead pastor and an elder of Providence Church. Born in Houston, Afshin move d with his family to their native country of Iran when he was two years old. In the midst of the Iranian Islamic Revolution, Afshin’s family moved back to Houston at age six. In the second grade, he was given a Bible by a tutor who was teaching him the English language. He read that Bible 10 years later as a senior in high school and came to faith in Christ. Afshin received his undergraduate degree in history from the University of Texas at Austin. He went on to receive his Master of Divinity with Biblical Languages degree from Southwestern Seminary in Ft. Worth, Texas. In 2008, he married the love of his life, Meredith. Afshin and Meredith have three young children. Before coming to Providence, Afshin traveled around the world proclaiming the Gospel of Jesus Christ in churches, conferences, and missions. He also traveled to the Middle East to train Iranian pastors. Afshin serves on the Board of Directors for Vertical Bible Study at Baylor University in Waco, Texas and East-West Ministries in Plano, Texas. For booking requests, email Rachael Deatherage at rachael@providencefrisco.com.